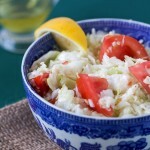 “Why didn’t I hear about this salad before?” fresh shredded cabbage and tomato salad with a lemon vinaigrette. 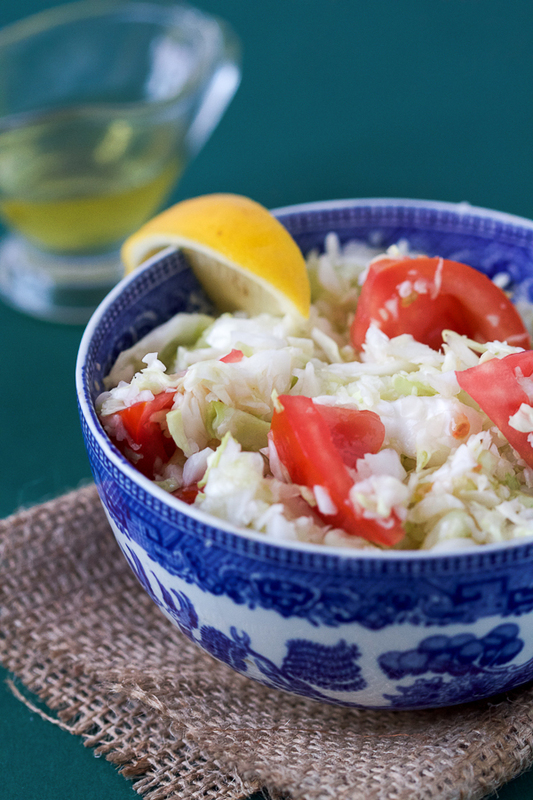 We’ve done a similar shredded cabbage salad to the one we’ll be making today. I decided to do an almost identical one as tis the season of fresh cabbage, and it inspired me to spread some cabbage love. Why I love this salad (and I’m notorious for not loving salads except maybe the Russian and Shopska salads), is the freshness, the kick from lemon vinaigrette, and the chunky tomatoes that top it off. 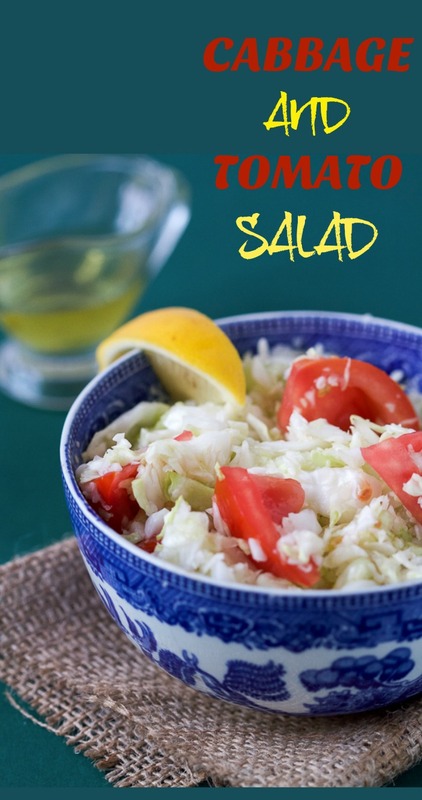 As it is, after all, a shredded cabbage salad, it falls under the dreaded cole slaw, but I assure you it’s nothing like your average one. For one, there’s no mayo or sour cream topping that make it into a slab of disgustingness. Secondly, this type of preparation – waiting a period after it’s shredded so its juices seep to the bottom of the bowl, and then mixing it with the vinaigrette and its own juices – introduces a whole new taste of this seemingly plain plant. Those first years in America passed in a fury, although at the time, the time moved ever so slowly. The summer of ’95 was a hot summer in Alexandria, Va. I know what you must be thinking “1995, how long ago was that! ?” I must sound so old to you. And sometimes I feel entirely tired and too old for these 30+ years, as if I’ve lived four lives in one so far. For one, there is an infinite amount of knowledge I do not know and may never learn. But one thing is certain, there will come a day when you, dear reader, describe 2015 to someone and they will look at you as if you are at least a little bit challenged, if not coming from a different planet. The same look I, back in the day, casted at folks talking about 1975. But these years – and the experiences you deserve – do grant you a certain certainty that time is fluid, and it expands and contrasts in a strange way in this realm of ours. One day is equally short and equally long. You can go back to any day and have a feeling it happened yesterday, and have also a feeling it happened twenty years ago, and be equally right both times. Ah yes, it was hot that summer of 1995, in Alexandria. Every summer in Alexandria is hot, every summer before the one we arrived, and every summer since then. Sarajevo can be hot, boy can it be hot. But we’ve never experienced such warmth of air before, such humidity that grabbed the throat and forbade breaths to come in and out. This daily chocking was hard to get used to. We spent those first few days acclimating to the difference in temperature between outside (hot, choking, sticky), and the blasting air conditioning inside (cold, refreshing, frigid). It was tiring just to walk from our building doors to Uncle E’s building doors, even though he was just a few doors down. An apartment was rented for us in – we later realized – the ghetto, on a street called something like Mary Lynn. The apartments were cheap so our sponsorship agency placed most of us Bosnians there. They paid the apartment for the first year, so this neighborhood was a good compromise – by placing a lot of us there it provided a veil of community protection, while they weren’t shelling out a penny more than necessary. Coming from Europe, where every centimeter of space is so valuable and hard to get to, Mary Lynn apartments were spacious and airy, its red and brown brick buildings charming, its terraces large and fantastic. But it was then, exactly what it’s today, a place where drug deals happened, where there were stabbings, and fights, broken bottles and blunt roaches, and roaches inside too. Kids skateboarding off trucks, a disregard and disrespect for everything. But it was also what it is today, long, hot, empty afternoons, a small but real life swimming pool, and a large parking lot. And time passing ever so slowly, that even if you were terminal your days felt incredibly long, the grass was greener than anywhere I’d seen it. And the neighbors, as long as you didn’t get into their business or try to get them involved in yours, fair and tolerating. Wash cabbage, discard 2-3 outer leaves. Quarter it, and then grate coarsely (cut out the thick root in the middle and discard) and place in a larger bowl. Pour salt over it and mix well. Leave for 30-45 minutes until cabbage sweats out its liquid. Chop tomatoes into medium chunks. Add to the cabbage, and mix everything well together with the liquid the cabbage sweated out. Make a vinaigrette by mixing juice from one lemon, oil, parsley, salt and pepper. Pour evenly over the salad and mix well.